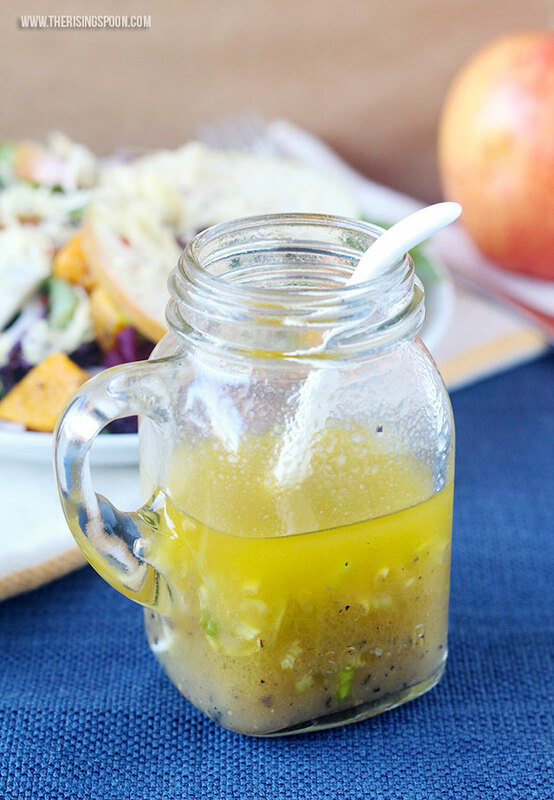 An easy apple cider vinaigrette recipe using healthy ingredients like fresh apple, raw apple cider vinegar, and maple syrup. 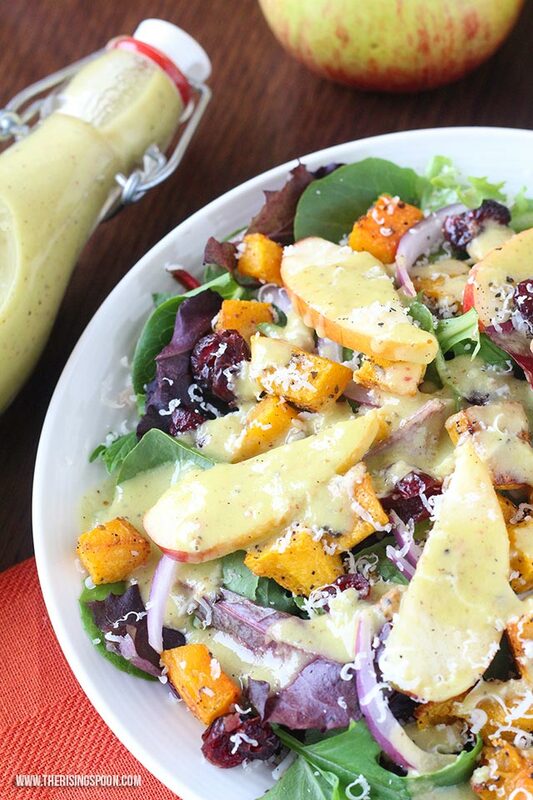 This dressing only takes five minutes to fix and includes two versions that you'll love: creamy and whisked. 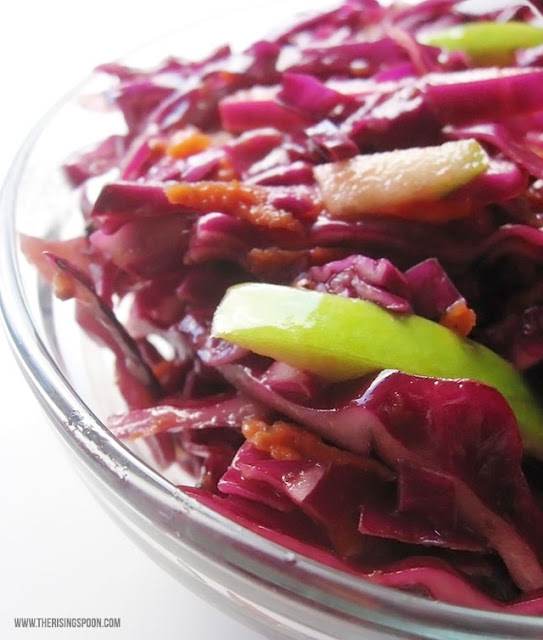 It's perfect for drizzling on top of leafy salads for a blend of sweet and tangy flavors. One of my favorite sides to serve with dinner is a leafy salad piled with toppings from my pantry and fridge. 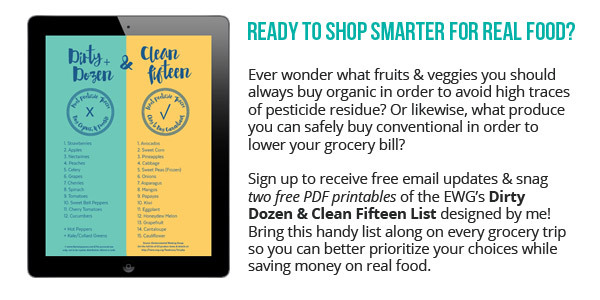 It's an easy way to use up leftovers and sneak in extra servings of veggies. I like to rotate my toppings and homemade dressings based on the season (or...let's be honest, my cravings at the time). It feels like I ate blue cheese dressing almost every day this past summer. 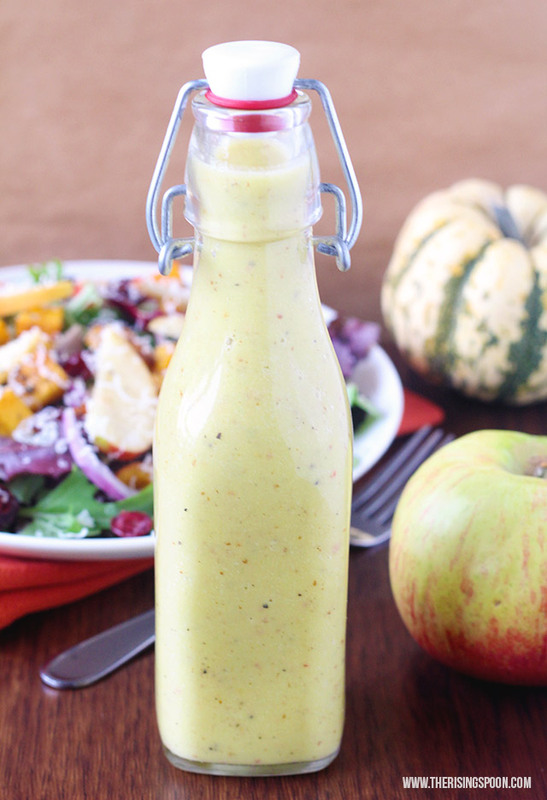 During the fall and winter months, I often use sliced apples and grated sharp cheddar on my salads (love that combo), so I came up with this apple cider vinaigrette to pour on top. 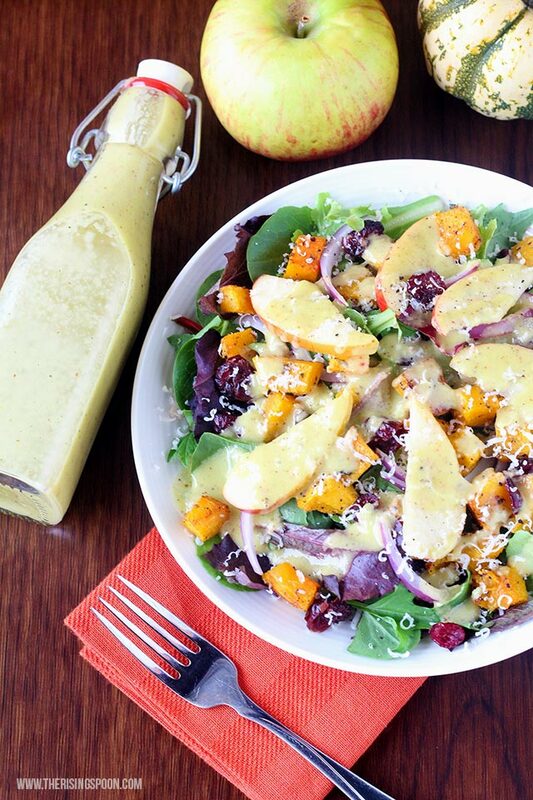 Fresh apples + apple cider vinegar = a no brainer, right? I always keep a bottle of raw apple cider vinegar on hand for making homemade bone broth (it helps pull the minerals from the bones), so this dressing is a great excuse to use it more often. Especially since it has a host of health benefits (you can read more about apple cider vinegar as a superfood here) and pairs well with the flavors of many seasonal fall & winter ingredients. I usually just whisk or shake my vinaigrettes on the fly, but was recently inspired to use a regular blender instead. 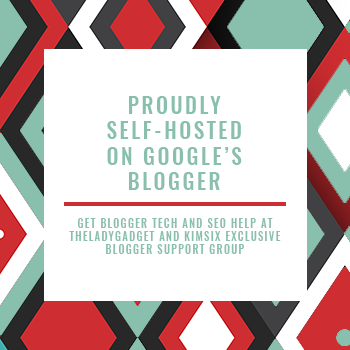 Why use a blender? 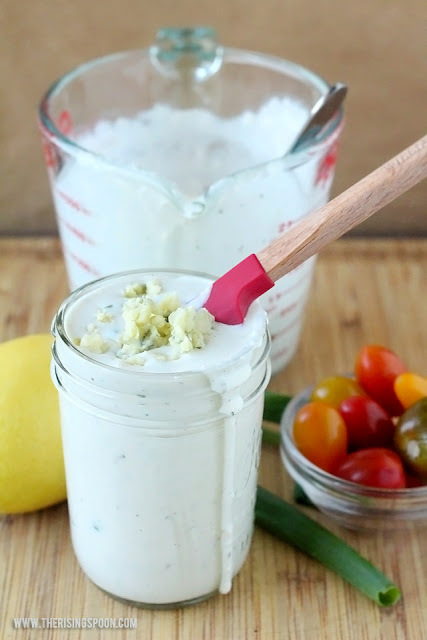 It does an extra good job of emulsifying all the ingredients, which creates a creamy dressing! It also gives you extra bits of fresh apple goodness in your dressing, without having to rely on apple juice, which (in my opinion) is soooo sweet. In contrast, the creamy version clings to the lettuce and toppings so you can pour it on at the beginning of a meal and eat it whenever you like. 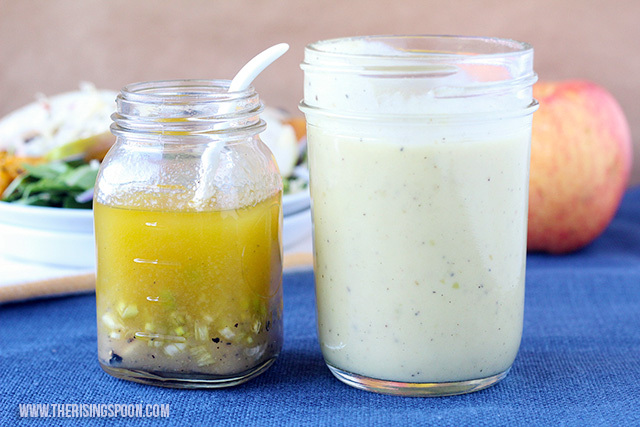 The other benefit of a blended dressing is a consistent flavor, which is beneficial if you're serving it to a person who doesn't want get a bite with too much tangy vinegar (I don't have that problem). 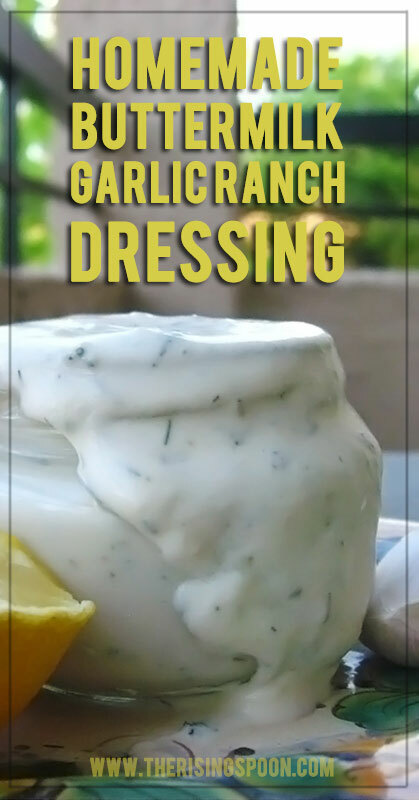 Having tried both, I probably prefer the whisked dressing only because I really enjoy a strong vinegar flavor; however, I'm happy to have the creamy version to switch things up or make ahead of time. Since it's already October, I threw together a fall themed salad with leafy baby greens, grated sharp cheddar, sliced apples, dried sweetened cranberries, sliced red onion, and roasted butternut squash (that I had leftover in my fridge). Pomegranate seeds or toasted pumpkin seeds would be another great option. When I make this dressing during the summer, I'll still use sliced apple (I usually keep a few in my fridge for smoothies or snacks) and grated sharp cheddar on my salads, but switch up the ingredients to things like cucumber and tomato. 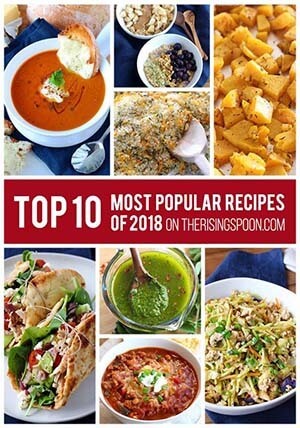 It's really good all year long, so don't feel like you have to only use fall ingredients! For the Creamy Vinaigrette: Remove and discard the apple core, then chop into chunks; add to blender. Thinly slice the green onion, then add that + the vinegar, maple syrup, mustard, lemon juice, and salt + pepper to the blender. Pulse everything a few times to start breaking up the apple, then pour in the extra virgin olive oil and blend for about 30 seconds to a minute, or until all the apple is broken up and the oil is emulsified. Taste the dressing and add more salt + pepper (or tweak the ratios of other ingredients to your preference), if need be. Serve immediately and store any leftover dressing in a container with a tight-fitting lid. This should keep for 3-5 days (probably longer). For the Whisked (Non-Creamy) Vinaigrette: Omit the fresh apple and combine all ingredients except for the olive oil in a small bowl. Slowly pour in the olive oil, vigorously stirring the ingredients together with a whisk or fork, until the olive oil has combined with the vinegar. You can also achieve this by combining everything in a jar or container with a tight-fitting lid and shaking it several times. Taste the dressing and add more salt + pepper (or tweak the ratios of other ingredients to your preference), if need be. Serve immediately (re-whisking or shaking the vinaigrette as needed to combine the oil + vinegar) and store any leftover dressing in a container with a tight-fitting lid. This should keep for 3-5 days (probably longer). What's your favorite way to use apple cider vinegar in a recipe?